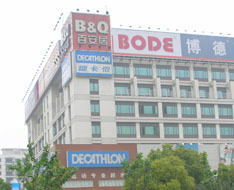 VILLENEUVE D’ASCQ, France – Tianjin is the tenth Chinese city where Décathlon is opening an outlet. The 4,000-square-meter store will have its own ice rink and golf range. But Décathlon’s ambition goes beyond opening more stores. Via its parent company Oxylane, Décathlon is also starting to co-develop high tech products together with Movea SA. This French company is a global player in technology, patents, and products for motion-sensing applications, the MotionSenseTM Technology. Oxylane will get access to advanced motion-sensing technology for use in athletic equipment and apparel. To develop the pioneering athletic equipment, Movea will work directly with Oxylane product designers. “With Movea we have found a strong partner for the development of innovating products based on motion capture technology”, said Stéphane Marchioni, Electronic Products Manager at Oxylane. Created in March 2007 by a team of industry leading researchers and executive management, Movea SA was founded from the French research institute CEA-Léti specializing in motion sensing technologies. Headquartered in Grenoble, France and Milpitas, California, Movea is a global player in technology, patents, and products for motion-sensing applications in consumer, healthcare, mobile, and other markets.